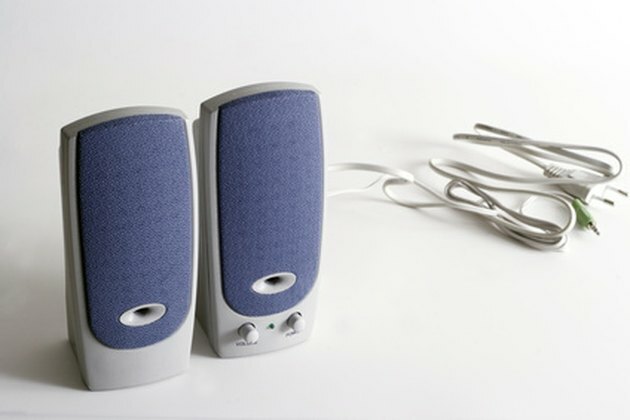 A wireless speaker system is convenient in that it eliminates the need for cumbersome cords. This makes it much easier to arrange your furniture and eliminates an unnecessary danger from homes with children or pets. Wireless speakers also are simpler to move. A good wireless speaker system can receive audio signals through walls and floors so that you can enjoy your music even in different rooms. Setting up a wireless speaker system is simply a matter of connecting your computer to the transmitter and positioning the receiver. There are several ways to connect a wireless system, but USB systems are easiest. A wireless speaker system may give mini computer speakers the boot. Plug the USB transmitter into any USB port on your computer. Install the drivers and/or software necessary for the wireless speaker system. Sometimes the drivers and software are right on the USB transmitter so your computer automatically will run an installer, but other times you have to put a driver/software CD into your computer CD drive and install the drivers manually. Connect the receiver to your stereo. Depending on the system, you'll connect using either the "audio in" ports or the "auxiliary" port. If wireless speakers are included as part of the system--that is, you don't need to convert wired speakers to wireless--the wireless speakers will have the receiver inside and you can skip this step. Look in your media player interface and preferences to see whether you can set the computer to use a specific set of speakers--iTunes has this capability. Some systems will automatically override your computer speakers as long as the transmitter is plugged into the USB port, but if the system doesn't do this, you will need to tell your player to use the wireless system rather than the computer speakers. Test the wireless speaker connection by opening and playing an audio file with your media player. Remember that the receiver on the system must be set to "on."